Early American Revolutionary War plan of Boston closely following the Battle of Bunker Hill. An uncommon and attractive 1775 map of Boston issued in the early days of the American Revolutionary War just following the Battle of Bunker Hill. The map covers the original peninsula of Boston as well as the ruins of Charleston just across the river. The plan names streets, including Beacon Street with a topographical representation of Beacon Hill, Newberry Street, and indications of fortifications, batteries and other landmarks. Major buildings are represented as are wharfs (including Hancock's Warf, Long Warf, and Griffins Warf, among others. The mill dam is identified. This map was issued for British readership in the early days of the American Revolutionary War following the Battle of Bunker Hill, which, as the map notes, has left Charlestown in ruins. This, together with two other maps was intended to provide the readers of The Gentleman's Magazine with 'a perfect representation of the present Sea of War in America.' At the time the Battles of Lexington, Concord, and Bunker Hill left the British forces in Boston under serious threat from Continental forces under the command of George Washington. The pre-19th century geography of Boston is noteworthy. 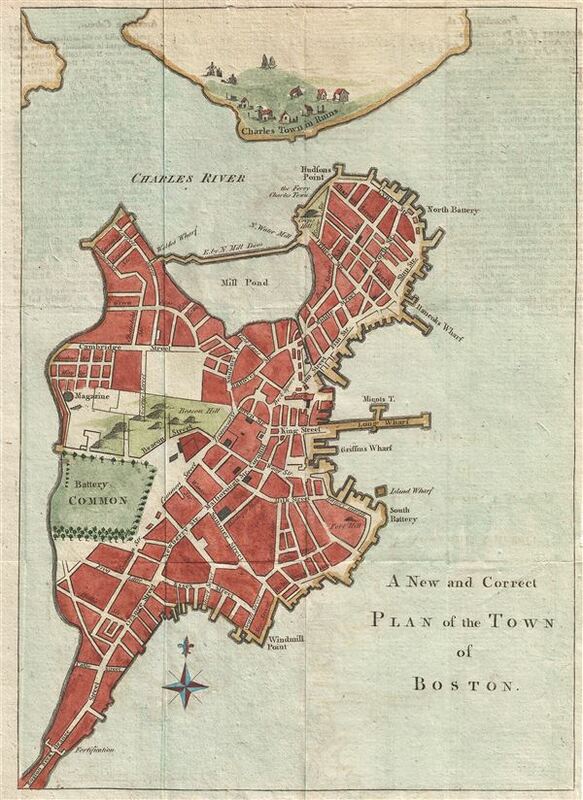 When this map was drawn, Boston was essentially an island linked to the mainland via a narrow causeway. This map thus provides a kind of 'baseline' from which to examine later images of the city, as it predates the extensive filling that created South Boston, Back Bay, and much of East Boston. Issued for the October 1775 issue of The Gentleman's Magazine. The Gentleman's Magazine (fl. c. 1731 - 1922) was an English periodical founded by visionary Edward Cave. Considered the world's first monthly general interest magazine, GM was also known as Trader's Monthly Intelligencer. Cave's innovation was to create a monthly digest of news and commentary on any topic the educated public might be interested in, from commodity prices to Latin poetry. It carried original content from a stable of regular contributors, as well as extensive quotes and extracts from other periodicals and books. Cave, who edited The Gentleman's Magazine under the pen name "Sylvanus Urban", was the first to use the term "magazine" (meaning "storehouse") for a periodical. The iconic illustration of St John's Gate on the front of each issue (occasionally updated over the years) depicted Cave's home, in effect, the magazine's "office". Among the important firsts of the The Gentleman's Magazine are the first use of the term "magazine" for a periodical and the first regular employment of lexicographer Samuel Johnson. The Gentleman's Magazine, (London) v. 45, October 1775. Very good. Original fold lines. Jolly, D. C., Maps in British Periodicals, GENT-239. Sellers, John R. and Van Ee, Patricia, Maps and Charts of North America, no. 890. Boston Public Library, Leventhal, G3764.B6S3 1775.P35. List of maps of Boston Published Between 1600 and 1903, Boston Engineering Department, page 50.